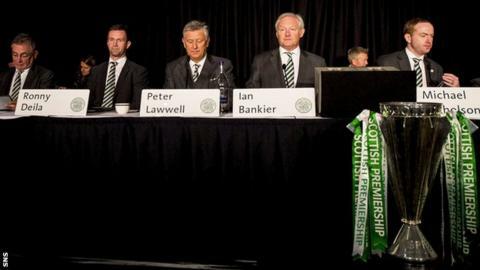 The Celtic annual general meeting is an opportunity for reflection. Attention will be drawn to solid financial results, on-field performances and optimism for the future, but deftness will still be required by the directors. Shareholders will take the chance to address awkward, and in some cases recurring, issues. It is, though, a measure of Celtic's stability and long-term business and performance strategy that the prickly topics do not directly concern the club's fundamental purpose. The team failed to qualify for the Champions League group stages for the second consecutive season, but they top the league and will look to build on last season's domestic double. The accounts also reveal a well-run business that operates close to or at break-even, making a substantial profit if the team reaches the Champions League group stages and making up the shortfall when it does not from player sales. In many respects, Celtic's operation is the model for other clubs to follow. There will be no upheaval, since Dermot Desmond's majority shareholding ensures that resolutions will be passed and directors will be voted back on to the board for another term. The Irishman is unlikely to attend, since that has been his long-standing habit, but he remains the controlling figure. At last year's AGM, manager Ronny Deila spoke of pursuing the treble and reaching the Champions League group stage. These are the goals of every campaign, and Deila has fallen short in his 17 months in charge. Frustration exists, naturally, amongst the fans, even if many can rationalise the situation. Deila is not a man under direct pressure, since the club's instinct is to nurture managers but also because there is recognition that the summer was one of transition. Shareholders may question aspects of the team's defending, particularly in Europe. Yet there is general acceptance amongst fans that Celtic's football strategy is sound, even if recruitment is challenging when the focus is on signing players of potential so that they can be developed. The sales of Virgil van Dijk and Adam Matthews this summer will be recorded in next year's accounts, but the strategy remains the best way for the club to try to maximise its resources. Even so, there is concern that some of the players signed last summer have fallen short of the required standard. This is the other aspect of Deila's responsibilities. He has to improve players and the progress of Leigh Griffiths, Stuart Armstrong and the emerging Kieran Tierney are evidence of the worth of his work. Recent results are a bane for Deila and the board, since losing back-to-back matches to Molde in the Europa League has left the team's hopes of qualifying for the knockout stages under pressure. Nonetheless, the bigger picture of Scottish football's constrained finances is understood well enough for disappointments to generally be contained. The Celtic Trust has tabled, again, a resolution instructing the board to make Celtic an accredited Living Wage employer. The board has previously revealed that raising the wages of all staff to that level would cost about £500,000, and pointed out that the club is the only in Scotland to hold the Investors in People award. In the past 12 months, Celtic have implemented a wage rise to £7.85 an hour - the Living Wage rate - in part by the removal of a discretionary bonus scheme. The club has not signed up to the Living Wage Foundation, and chief executive Peter Lawwell has previously claimed that politicians and campaigners have used the club's name to raise more publicity for the issue. A portion of the fan base remains committed to urging the club to sign up for the Living Wage, even if it is not commonplace in football - Hearts are the only top-flight Scottish club to be accredited. Questions will be raised from the floor on the topic, but the board have already supplied their response with the wage increase. Another topic likely to be raised during shareholder questions arises from the same sentiment: the insistence by many fans that Celtic remain true to the founding values of the club in working to alleviate poverty. The Celtic Foundation carries out wide-ranging and significant charity work, including donations to refugee support programmes, but there are ideals that an element of the support holds dear. Lord Livingston, the non-executive director and Conservative peer, voted in favour of the UK Government's tax credit cuts policy in the House of Lords, an act that drew criticism from some fans. An online petition was started, which has attracted 9,946 signatures, for his removal from the board. It will be an uncomfortable moment for Lord Livingston, if he attends, but there is a balance to hold between the values that many fans believe to be central to the club's ethos and its openness to individuals from all backgrounds, political or otherwise. Lord Livingston is a valued director and will be able to separate his political life from his position on the Celtic board. Celtic have, in a sense, already made their position clear. The club released a statement last week in relation to the Court of Session upholding HMRC's appeal against the tribunal's ruling that Rangers did not owe additional tax from their use of Employee Benefit Trusts. "In 2013, we expressed surprise... over the findings of the SPL Commission that no competitive or sporting advantage had resulted," said the Celtic statement. "That remains our view." The Court of Session decision, which followed two tribunals finding in Rangers' favour, can still be challenged at court level, with a deadline of 2 December. Celtic are highly unlikely to be drawn further on the matter in the meantime and see it as a matter for the Scottish Professional Football League to investigate whether further sanctions can be applied. Supporters want titles to be stripped, even though the Lord Nimmo-Smith Commission in 2013 ruled that the side letters relating to the EBTs Rangers supplied to players should have been disclosed to the Scottish Football Association and imposed a £250,000 fine. Amongst the shareholder questions is likely to be one concerning whether or not the football authorities in Scotland handled the matter appropriately and within their rules. It is one that Celtic cannot answer, other than to assure fans that they have made or will make the appropriate representations themselves. It remains, ultimately, a matter for the SPFL and the SFA. The AGM will as always be a mixture of corporate routine and shareholder questions. The board has navigated them before and will do so again. The playing and financial results are, after all, the most crucial. Some fans will argue that both ought to improve and directors will counter that Celtic operate in as best a way as they can within the challenging environment of Scottish football.